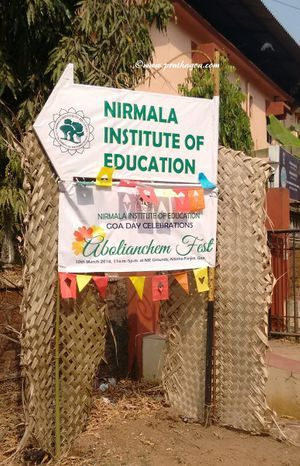 The Abolianchem Fest, dedicated to the abolim flower, was celebrated by the Nirmala Institute of Education as the institute’s annual Project Goa celebrations to showcase the socio-cultural aspects of Goan culture before 1975. This included music, games, songs, dances, food, art, craft, etc that is authentically Goan, so as to document and preserve these positive attributes of Goan culture for the benefit of present and future generations of Goans. The festival saw the revival of interest in the abolim, or firecracker flower, also known by its scientific name of Crossandra infundibuliformis. Although it was named the state flower in the early part of the 1970s, there has been a decline in the presence of the flower in most parts of Goa. 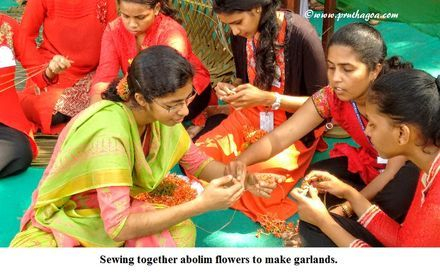 The abolim flower has been an integral part of religious and cultural rituals in Goa for years, and its resurgence has been spearheaded by the Abolianchem Fest. Nirmala Institute of Education, where the Abolianchem Fest was held, has been Goa’s foremost secondary teacher training institute, established in 1963 by the Society of the Daughters of the Heart of Mary. 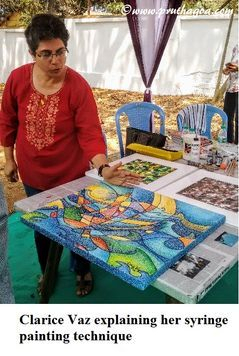 Project Goa emerged in 2000, based on ex-English Methodology Lecturer Ms Sharmila Veloso’s own English project which involved groups of students making a presentation on a facet of Goan culture. The entire college took on Project Goa as a means of salvaging Goan identity from the degrading image tourism had assigned to it. Nirmala Institute of Education is one of the educational institutions that has been handed the baton of celebrating Goan culture by Goemcho Festamkar, Marius Fernandes. The preparations leading up to the festival were numerous, including workshops by prominent Goan personalities – a tiatr workshop by Prince Jacob and Michael Gracias; a media workshop by Sulochana Pednekar and Sanjeev Sardesai; a workshop on the traditional flowering plants of Goa by Miguel Braganza; and a ghumot workshop by Dr Pandurang Phaldesai. Thomas Fernandes, a farmer, taught the students and staff how to plant and nurture the abolim plant. There were also workshops held by Pound Pro instructor Cliszma Da Costa, Olavo (O’luv) Rodrigues and others. The festival was a delight of vivid colours and sounds, smells and sights of traditional Goa. The students performed the mando, the dekhnni, the fugdi, Konkani songs and many more performances. A theme song for the Abolianchem Fest was composed by Dr Glenis Mendonca and the students of Nirmala Institute of Education, and was sung by the students. Savio Godinho was there with his tasteful face painting and painted tattoos, and Clarice Vaz demonstrated her unique syringe painting technique. 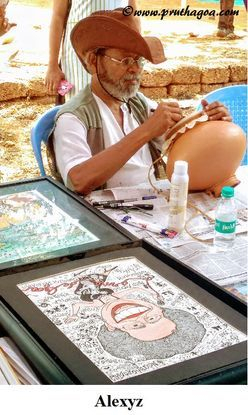 Cartoonist Alexyz used the ghumot as his canvas to paint caricatures of willing participants. The brass band entertained the audience intermittently. Goan personalities striving to make a difference in the social and culture life of Goa were interviewed. Prajal Sakhardande spoke about teaching students true history and that the teachers coming out of the institute had a responsibility towards this mission. He spoke about his own work in safeguarding heritage sites. Other interviewees were women’s rights activist Auda Viegas, Konkani playwright (tiatr) Tomazinho Cardozo, etc. On display were the procedures of making mollam (woven coconut tree fronds) and garlands of abolim flowers. Explanations of various Goan games were put up, like fatranim (five stones), koyando-bal (gilli-danda), kombeajuz (cockfight), biyani (played with cashew nuts), and so on. With the help of Miguel Braganza, the students of Nirmala Institute of Education exhibited different indigenous plants that had immense medicinal value such as the jaswandi (shoe flower), which can help lower blood pressure and reduce the loss of hair, and kesri (Bixa orellana), which can be used to cure skin diseases and burns. 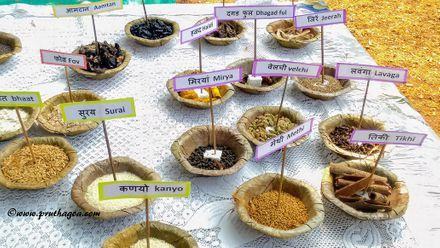 Condiments and grains with their English and Konkani names were presented. 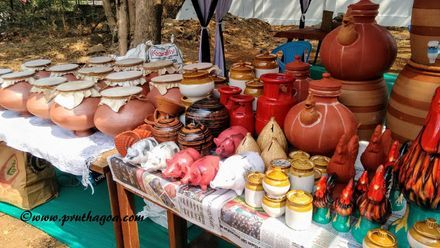 There were stalls with handicrafts by the students as well as traditional Goan pots, ghumots and other clay products on sale. 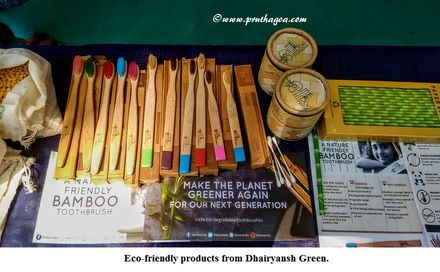 Dhairyansh Green, an eco-store, had a stall selling cloth and biodegradable pads, wooden combs, toothbrushes made of bamboo, paper straws, seed jewellery and other eco-friendly products. The Goan jevonn (food) consisted of kanji (rice gruel), sanna (rice cakes), shirvoleo (rice noodles with a coconut and jaggery mixture), mackerel cutlets, chicken xacuti, bebinca, pinagre, and so on. Abolianchem Fest was, without doubt, a successful endeavour that brought much joy to the participants, and the organisers (students and staff of Nirmala Institute of Education) must be commended on the excellent job done bringing forth this festival to disseminate Goan culture under the guidance of several Goan experts in their respective fields.